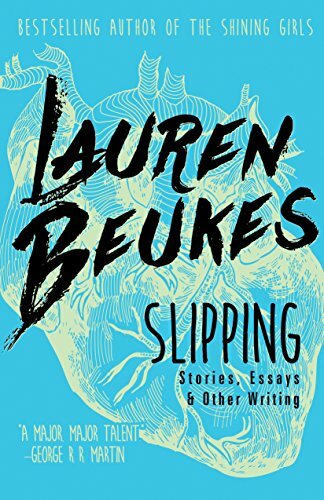 Slipping is a collection of Lauren Beukes’ previously published shorter works that shows off her skill across a range of genres. From the opening piece, it is easy to see that Beukes is not afraid to shock. Though across several such stories Beukes appears to be generating story lines according to a formula. She first sets up an unfamiliar scene without much explanation then adds details to provide context. This “works“ for readers who enjoy figuring out the “who” in the whoduniit, though for these it’s more akin to figuring out the “what” in the what-the-heck is going on. Many of Beukes’ stories are fascinating and gross at the same time. She is known for her science fiction novels, though not all the stories in this collection are science fiction— The Shining Girls and Zoo City. What pushes science fiction beyond its boundaries as a genre is whether or not the characters have depth, whether they are more than cardboard or cliché—that you can care about them, and whether there is something other than technology and warfare that moves the story along. The answer for Beukes has to be yes and no depending on the story. She intentionally writes cartoony stories with cartoony characters though she also writes more serious stories. Imagine being an environmental exploiter on a planet similar to Pandora in Avatar, only this time it is the flora on the planet that are lethal, and extremely so. Given a horrifically hostile planet, readers have little choice but to be sympathetic to the exploiters. Imagine a reporter embedded with a team of government electronic eavesdroppers. This time the eavesdroppers are the ‘good guys’. Imagine an Internet scam from a point of view of the scammer; create a situation that allows a measure of sympathy for the scammer. Imagine the stalker’s view of the stalked. What about a twist? Make the stalker leave messages on the victim’s mechanical typewriter. Imagine a military prison modeled on Abu Ghraib, but on an alien planet. Imagine a Burning Man celebration that occurs concurrently with a seemingly apocalyptic event in the real world. Make people do horrific things for survival. At the end say sorry, it wasn’t the apocalypse after all. Imagine a very cartoony view of Japanese pop culture, in the style of Haruki Murakami. Mix in manga and Madlibs. Read as hilarity ensues. Several of Beukes’ stories are geared towards modern youth culture (i.e. the “millennials”) and their “take” on culture, whether online identity, fairy tales, celebrity, reality TV, or art-hype. Her stories are slangy, druggy, and cool, with a measure of irony, as ironic-cliché, or ironic-introspection. Some of these stories might fit easily within the pages of The New Yorker though others are not much more than writing exercises; for example, one short story is constructed of tweets compiled for a literary festival, while another is constructed of paragraphs whose first word begins with sequential letters of the alphabet, A, B, and so on. Several stories are set in South Africa, where Beukes is from, and use South African slang. A few unfamiliar words will be explained, others the reader should be able to figure out from context, and others can be found in the glossary at the back. Many of the unfamiliar words refer to consumer products (mostly food) and music. It has been said that short stories are unprofitable but of value for authors who are exploring a range of techniques and styles. That is the case for this collection, though what is consistent throughout is Beukes’ word play and vivid imagery. This author certainly has an ear, a sense of how words sound and her prose can be quite poetic; as such, Slipping can be read just for the beauty of the English language. Slipping has been organized into two sections. The first contains Beukes’ works of fiction and the second is very short, only 30 pages of nonfiction: essays and interviews. The essays are of value in that they explain to the reader just who Lauren Beukes is. One is a memoir of the author as professional journalist. Another is an interview of a South African high court judge, and in the interview the reader might be reminded of the fierceness of journalist of Oriana Fallaci. For readers who are already familiar with Beukes’ work, there is an essay that lays out Beukes’ intent in the construction of The Shining Girls and Zoo City. Based on Beukes’ brilliant collection of short stories, one looks forward to her next novel, even if its genre does happen to be (ugh) science fiction. Robert Schaefer is a staff reviewer at New York Journal of Books.